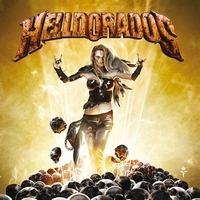 There is a new band in Germany who play a mix of heavy and sleaze metal, Helldorados from the city of Stuttgart. Their debut album is simply called Helldorados so it's easier to have something to identify them by. That might be needed, because their music is not exactly spectacular, and only one little step from being boring. Very few original ideas, nothing that you haven't heard before in the music world. Vocalist Pierre is not making a breakthrough, like another new sleaze metal band from Germany did, Kissin' Dynamite. Basically Helldorados sounds like an engine that could use another gear, but find themselves limited to only 4 gears. Of the 12 new songs, there is a mix of power loaded sleaze metal softer songs with melodic hooks, but they need some more energy in their songs. Never Gonna Stop is filled with mid-tempo melodic sleaze metal and makes an okay impression. Shout Out is a fast tune of catchy sleaze rock and one of the best songs from them. Double Dealer gets a hard rhythm section out between the ribs and appeals well to their fans. Hunter comes forth with raw power and fresh guitar work. I think they have potential for a lot of improvement, and then it would be interesting to see what they have on their next album.